It's great fun mod because using it you will be able to craft things out of chocolate. You will have armor chocolate, chocolate weapons and tools. Craft items of chocolate will be the same as you used to, but instead of ore can now be used chocolate. This mod on the musical block for Minecraft PE 0.10.0. 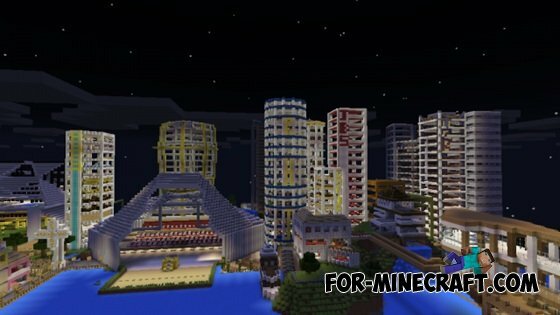 Musical block using special records will play music in the game Minecraft. Mod adds to the game a special indicator by which you can see how much health every mob in the game. This is a map with a small town for Minecraft PE 0.10.0. If you are tired of huge maps, and you just want to have fun relax then this map you should like. Script for miners v2 for Minecraft PE 0.9.5 - this is a continuation of mod for the miners to Minecraft PE. With this script you will be able to do mine from cobblestones boards and sticks that you can use for torches and other purposes.